I take it the instructor will probably be in a deeper pool of trouble that the learner in that case! I imagine instructors are trained well to keep an eye out for things to student would miss, so the fact they missed this sign is quite serious. I know that an instructor for Travel West Midlands was sacked after a trainee took a Metrobus under a low bridge under his supervision. 1.) What was the bus doing down that highly notorious road? I've even seen stickers in VP's cabs specifically banning buses from going down that road! 2.) Why did the driver not stop the bus? 3.) Why did the instructor not stop the bus? 4.) Why were neither of them paying attention to the road conditions? 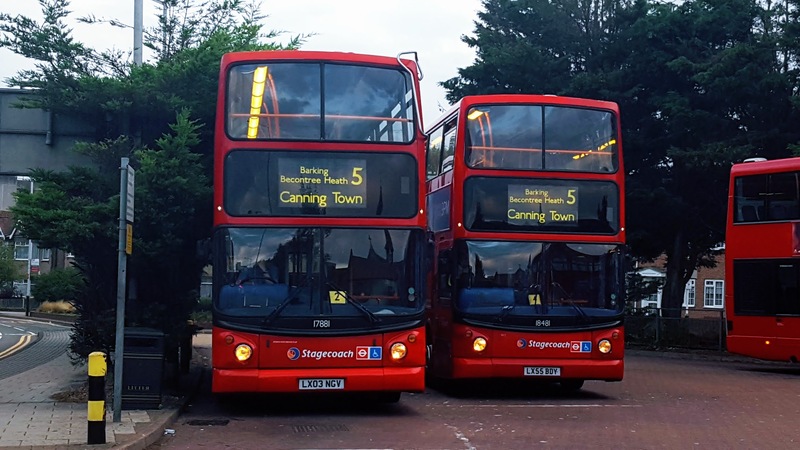 I remember when I was in an Abellio trainer bus, the instructor told me to turn down a road in West Byfleet where the bridge was 9' something, a single decker is just over 10'. Just before the turning, there was a road sign which showed the restriction and I immediately raised it. He said he hoped I'd do exactly that, but on this occasion it was fine. Think there's definitely equal culpability here - being a trainee driver doesn't stop you being aware of the size of the bus and road signs. Oh yess, that low bridge is crazy, yet 202 and 160 pass under it - so clearly not too low! There is also a 4.4m-er on 282 - also fine for a decker. 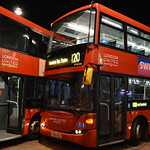 These are the lowest ones I know for DDs to safely pass under in London. That one for the Chiltern line is 14ft 6, the same as the ones by Hounslow East and Hounslow Central stations. There must be several more around London. Is St Mildreds bridge 14'3" now? I'm pretty sure it used to be 14'9"? 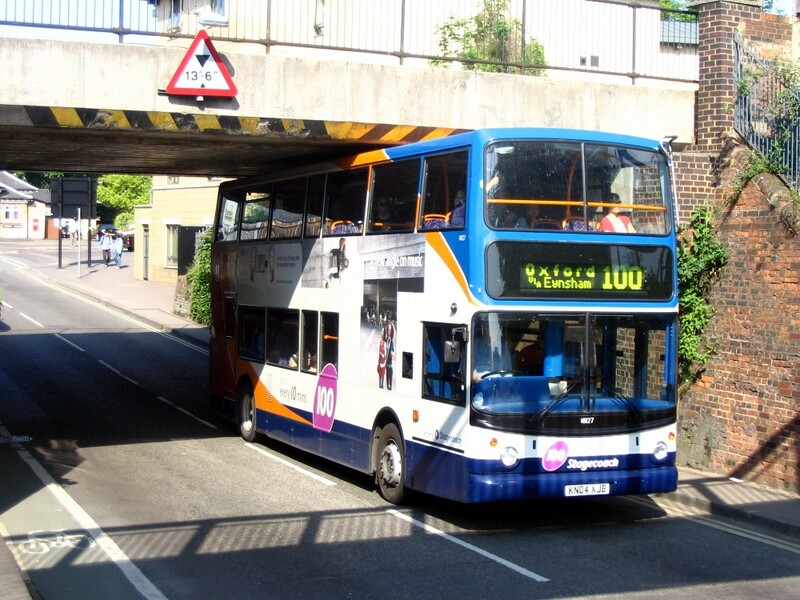 Certainly all manner of double deckers have passed under it over the years without a problem. A few lorries have come a cropper there but never a bus as far as I'm aware. BTW I thought it was an offence to take an 'over height' vehicle under a bridge even if you know it will fit? BTW I thought it was an offence to take an 'over height' vehicle under a bridge even if you know it will fit? The Streetview images for both sides of that bridge (by St Mildreds Road) quite clearly show 14'9" / 4.5m. I accept Streetview shots may be out of date but looking back to 2008 they all show the same height! I can't see any reason to remove 6" from the height measurement if they have recently changed the signs. There is a 14'6'' bridge potentially where the 415 extension will pass along on Surrey Canal Road IIRC. 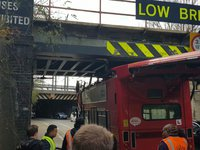 I could be wrong but the old bridge on Village Way was 14'5'' from memory yet double deckers could pass it under when the route via North Dulwich Station was blocked however, the replacement bridge is 14'3''. What happened with this learner Bus was it the drivers fault or trainers fault. I believe this is only an offence if the bridge is marked with a circular prohibition sign, in effect saying no vehicles over this height shall pass this point. If the bridge has a triangular warning sign then it is just that, a warning, and it is permissible to pass under if you know your vehicle will pass safely. The classic example I always give is the bridge at Oxford Station, which is marked with a triangular warning sign of 13'6 yet loads of low height 13'9 Scania and Trident E400 deckers pass under this bridge every day (mind you, sitting upstairs at the front, you'd think you are going to hit the bridge as clearance is minimal).